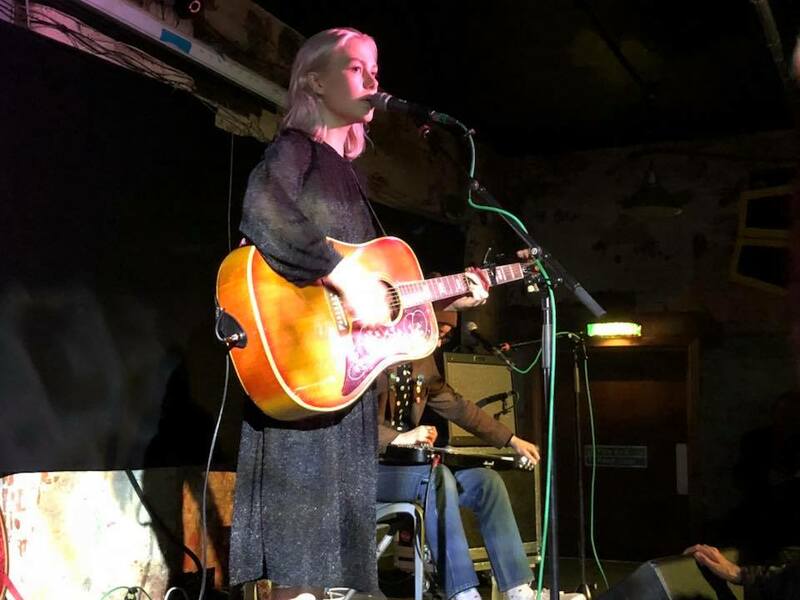 "This is my first headline show over here" announces Phoebe Bridgers as she comes towards the end of her ten song set at Manchester's Soup Kitchen to rapturous applause. For just over forty five minutes she holds an audience, most of them witnessing her for the first time, captivated with just a guitar, her accomplice Woody, her voice and a between song chat that grows in confidence and humour as the set progresses. "I've only got one album" Phoebe protests near the end as she tells us she only has two songs left "but I'm working on it" before playing a cover of Tom Petty's It'll All Work Out. "I have to" she says before lamenting Tom's passing while her President's still alive. Eight of the ten songs she plays come from that debut Stranger In The Alps, a dark intimate record that touches on death, murder, love lost and the uncertainties of life. For songs that are relatively simple in their structure, the power that Phoebe and Woody generate and which mutes the crowd during the songs is all in the delivery. You sense here that Phoebe is living every word she's singing, the emotion in her voice running close to cracking it at points, at others feeling like a catharsis, while Woody's use of both slide guitar and lap steel to accompany Phoebe's mix of acoustic (for the first half of the gig) and electric (for the second) both deepens the emotional fog, but also gives Phoebe's voice space to be heard. Being in the same room rather than listening to the album on lurid magenta allows us to enter her world. She even takes on Radiohead's Fake Plastic Trees, a brave move, but she makes it her own by not trying to ape the original but putting her own spin on it. She opens up more to us as she becomes more confident, joking about Funeral being the saddest song and then it'll get brighter, before adding "not much" and calling Killer "a classic love song", telling the tale of a day when all Woody and her did was sleep, eat, sleep, eat and sleep and laughing at the suggestion that she had matched the sparkly electric guitar with her dress before trying to explain Motion Sickness in terms of McFly's mum and Biff in Back To The Future (you had to be there to get it, I think). She leaves us wanting more, knowing we're going to out and tell our friends just how good it was and next time she comes back we'll be somewhere less intimate.